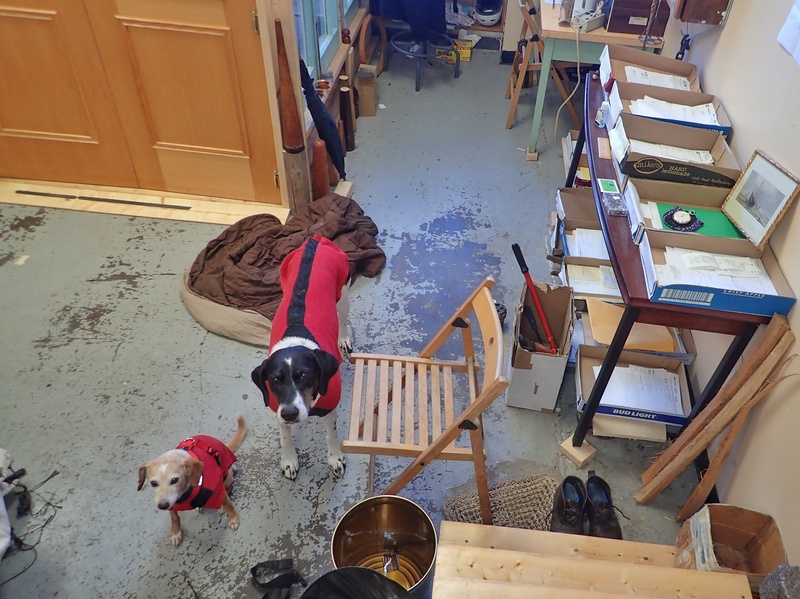 We are going through a little bit of a cold snap with temperature dropping below -20c (yeah…its only November) so yesterday seemed like a good day for a visit to the sail loft. MOpus, Enden and I (Murielle) went for a field trip. We want to come on the loft floor too… oh sad puppy eyes. We have known Andy for 20 years now (actually, Mark was a 16years old windsurfing bum needing a fix to his harness the first time he met Andy) and, with shared shared passion for traditional rigs, we like to think of our sailmaker as a friend. Andy is a friend who has become an important part of Mimi Jane’s journey. 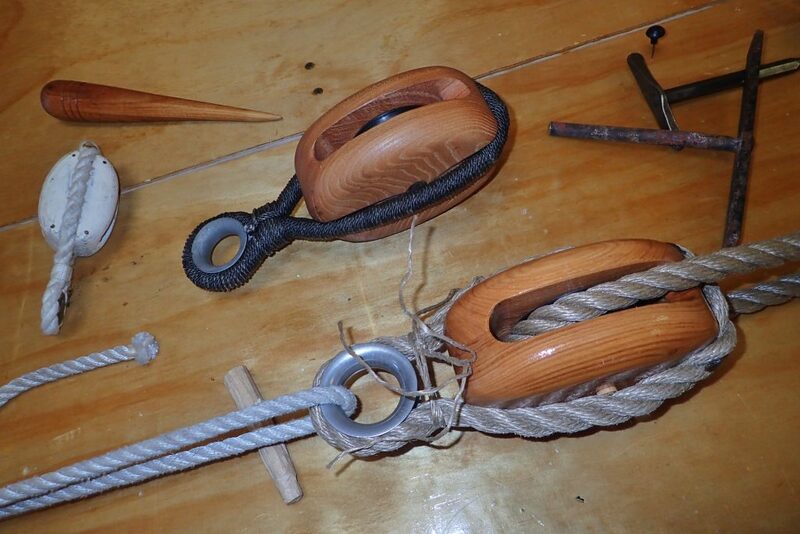 Working out of passion, Andy focuses his work on traditional style sails and rigging. He has suited many North American tall ships and a range of gaff, lugg rigged vessels so dressing up Mimi Jane is right in Andy’s aisle of expertise. Our sails are almost all done (and they look good!) 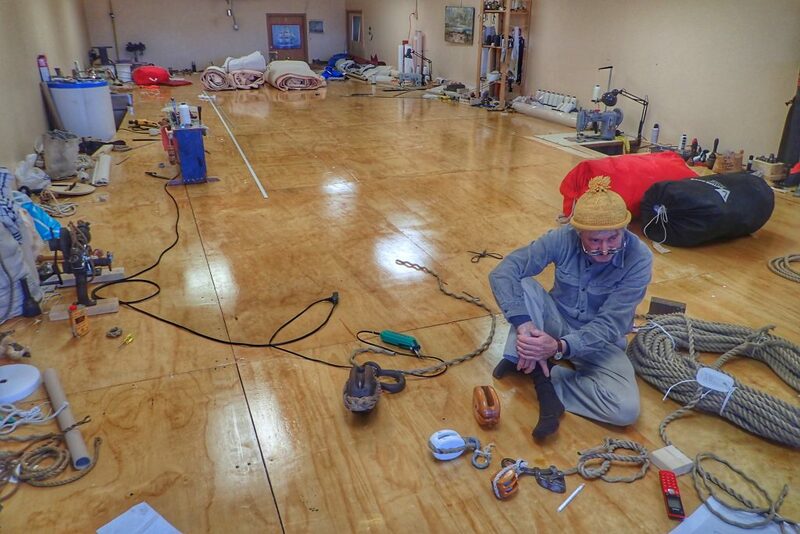 and Andy is now helping us master rope work to start working on the rig during cold winter days. Yesterday we went over the making of rope grommets for our blocks. Books are great, I tend to think I’m already pretty good at rope work, but there is nothing like gathering knowledge and tricks from an experts experience.